The Detoxifying Fast Flush Caps work as a flushing agent to cleanse your body of all unwanted drug metabolites allowing you to pass a urine drug test. After taking the Detoxifying Fast Flush Caps, individuals should be prepared to urinate frequently. This detoxifying product temporarily speeds up the urinary process during which the body breaks the drug metabolites down. Capsules remain effective from 1 hour after consumption up to 5 hours depending on metabolism and level of toxins in your system. Once the effects of the capsules have worn off the individual will continue to test positive for drug metabolites. 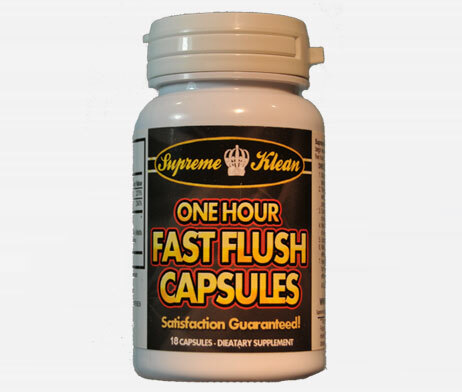 Which product works better, the Supreme Klean Detox Drink or Detoxifying Fast Flush Caps? Both products are equally effective for passing a urine drug test. The choice is a personal preference. Some people hate drinking a lot, and some people have a phobia of pills.